The Briggs Automotive Company (BAC) is a British sports car manufacturing company based in Speke, Liverpool. The company was founded in 2009 by brothers Neill and Ian Briggs to produce specialist sports cars targeted at enthusiasts. The company's first vehicle is the Mono, with the intention to create a pure driving experience with a central-seat format. The company produces the Mono, a single seater road-legal sports car launched in 2011. Engineers from Cosworth, Hewland, Sachs, AP and Kumho Tires partnered with designers at BAC. The Mono uses carbon fibre composite construction over a steel chassis (with FIA compliant rollover structure) inspired by the construction principles employed in DTM race cars. The nose of the vehicle provides a storage compartment and doubles as impact protection. The Mono is powered by a 2.3-litre four-cylinder Cosworth engine producing 285 bhp (213 kW; 289 PS) and 206 lb·ft (279 N·m), a heavily modified Ford Duratec. The engine is mounted longitudinally to maintain the centralised balance of the car. The car runs a F3-specification six-speed sequential gearbox developed by Hewland. This gearbox operates a semi-automatic transmission tuned to complete gear shifts in 35 milliseconds. These specifications result in a 0–62 mph (0–100 km/h) time of 2.8 seconds and a top speed of 170 mph (274 km/h). Weight-distribution in the Mono is focused on maintaining a low centre of gravity. The system includes a fully adjustable pushrod suspension system with damping elements made by SACHS Racing. AP Racing developed the retardation and stopping ability of the car. The Mono runs on specifically designed Kumho V70A road tires. During production, each vehicle is custom-built around the purchaser's body shape. The size of the seat, pedal reach and steering wheel position are modified in order to suit the individual's ergonomic requirements. The Mono ran 1:14.3 at the Top Gear test track. This makes it the one of the fastest cars to go around the Top Gear track on road legal tyres. In late 2012, the BAC Mono was featured in Need for Speed: Most Wanted. The BAC Mono also appeared in Grid 2 in 2013, Driveclub in 2014, and Project CARS and Forza Motorsport 6 in 2015. The Mono recently appeared again in "Forza Horizon 3" in late 2016. Steve Sutcliffe's "Car of the Year"
↑ "Company Details". Companies House. Retrieved 2011-03-24. 1 2 3 "Brit-designed single-seat racer revealed". Top Gear. BBC Worldwide. 2011-03-18. Retrieved 2011-03-24. 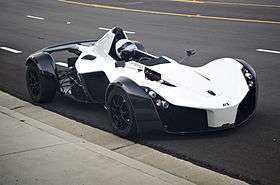 ↑ "BAC Mono, world's newest supercar, unveiled in Liverpool". Liverpool Echo. 17 December 2013. Retrieved 19 May 2014. ↑ "BAC Mono review". Autocar. Retrieved 19 May 2014. ↑ "Vehicle Specifications". BAC. Retrieved 16 October 2012. ↑ "Mono takes GQ Award!". BAC. 17 March 2012. Retrieved 16 October 2012. ↑ "TG Awards 2011: Stig's car of the year". Top Gear. 29 December 2011. Retrieved 16 October 2012. ↑ "Steve Sutcliffe makes Mono his 'Car of the Year'". BAC. 2011-12-19. Retrieved 16 October 2012. ↑ "XCAR Awards 2013: Best Drive, Drew". XCAR. 2013-12-16. Retrieved 5 February 2014.